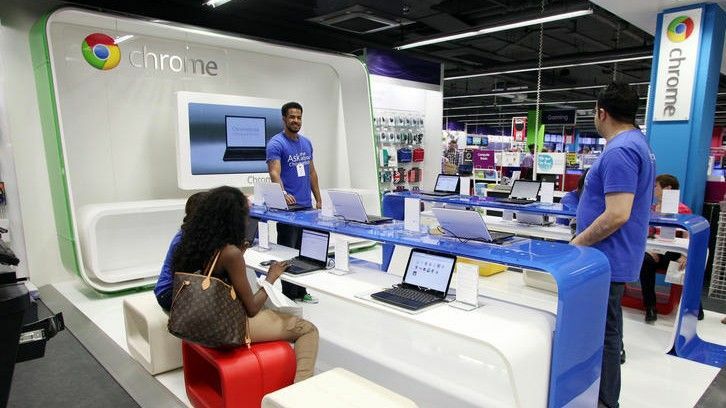 Google has launched its first shop-within-a-shop with the Chrome Zone, inside a branch of Currys and PC world on London's Tottenham Court Road. The Chrome Zone has been created to sell Google's latest offering - Chromebooks. The store's colour scheme is the same as that of Google's and will only sell the Samsung Chromebook for now. It will help explain the cloud OS system to the public. Acer's Chromebook is still not available in the UK, but that could be another Chromebook to watch out for in the store. "We've put a great deal of thought into the design of this Chrome Zone," said Arvind Desikan, head of consumer marketing for Google in the UK and Ireland. Mark Slater, category director at Dixons Retail, said: "Initial customer response to the launch of Samsung's Chromebook has been excellent and we are expecting a lot of customer interest and excitement now it is in-store." Slater added the mini-store will have dedicated staff trained in using the Chromebook. If you've visited, what do you think of the Chrome Zone? Let us know via T3's Twitter and Facebook feeds.